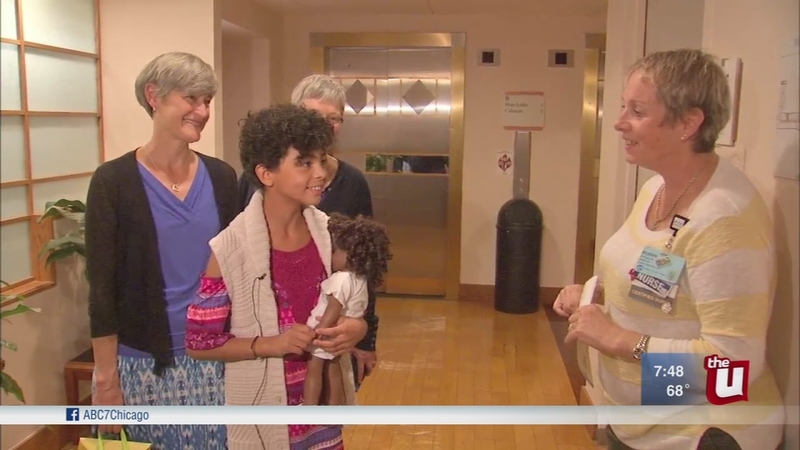 OAK PARK, Ill. (WLS) -- More than 100 Illinois children who were left by their parents at birth are alive today thanks to the state's Safe Haven law. It gives parents of newborns a legal option to give up a child at a hospital, police or fire station. On Wednesday, one of those children who visited the hospital where she was left 10 years ago. She has no recollection of it, but this is the place and the nurses who saved her life. And now, 10-year-old Aidan Jane Millar-Nicholson is getting to see it for the first time. "I liked meeting people, that was the number one thing that I really wanted to do. This is like really, extra, wow factor," Millar-Nicholson said. In August 2007, A.J. 's mother left her at the emergency entrance to West Suburban Hospital, apparently hoping they would care for her. It was all perfectly legal according to the Abandoned Infant Protection Act, or Safe Haven law, which allows babies less than 30 days old to be left at hospitals, police or fire stations with no questions asked. "It works when people know about the law. And Aiden Jane is the best example of that," said Dawn Geras, Save Abandoned Babies Foundation. It was a blessing for Lesley and Lori Millar-Nicholson, who were next on the list of parents waiting for adoptions. "The hospital social worker at the time came up to me and she said, 'You've got to keep her. Everybody wants this baby,'" said Lori Millar-Nicholson. "And I said, 'I bet they do, but she's coming home with us.'" Her parents said they've made sure A.J. has known all along the circumstances of her adoption. And she has donated proceeds from lemonade stands to the Save Abandoned Babies Foundation. It is also the first opportunity for the nurses who first cared for A.J. - who they called Baby Sunday at the time - to see the fruits of their labor a decade later. "We get thank yous very many times, but we very rarely hear how we impacted a family," said Robbin Uchison, West Suburban Hospital. A.J. is the 120th child who was saved by the Safe Haven Act since it became law 16 years ago. She's hoping that by drawing more attention to it, there will be many more.